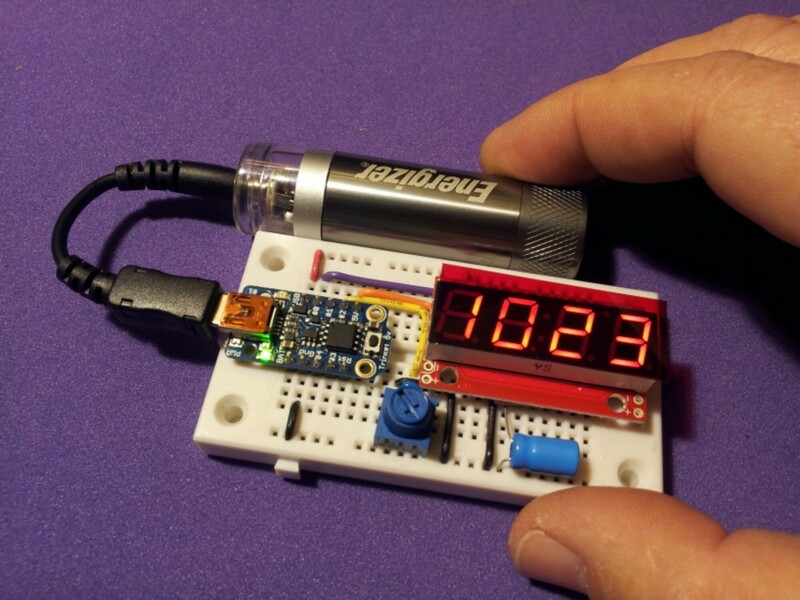 Serial transmission at 9600 bauds is possible with the Trinket ATtiny85 (5Volts, 8Mhz) from Adafruit. The analog value (0~1023) presented at the analog pin 1 is serially transmited to the COM-11441 ( 7-segments Serial Display from Sparkfun). Serial transmission at 9600 bauds using bit banging. (Trinket (5V, 8mhz). Analog 1 in presented in the 7-Segment Serial Display COM-11441 from Sparkfun. Using delayMicroseconds() for serial timming. BITTIME = 93 was adjusted experimentally. #define TXDATA  0       // Pin used to transmit data. #define POT     1       // pin used to read the analog value. #define BITTIME 93      // adjusted to obtain 104 milliseconds delay (9600bauds). pinMode(TXDATA, OUTPUT);   // initialize the TXDATA pin as an output. digitalWrite(TXDATA,HIGH); // TXDATA = 5V when is resting. delay(10);                 //Wait for Serial Display startup. sendChar('v');             //Reset the display 0x76. digitalWrite(TXDATA,bitRead(c, i));  // bit out. digitalWrite(TXDATA,HIGH);            //Return TXDATA pin to "1". while(strPot.length()<4)strPot= " " + strPot;   //format to 4 characters. Then the potentiometer is replaced by a keypad 3×4 and some resistors. 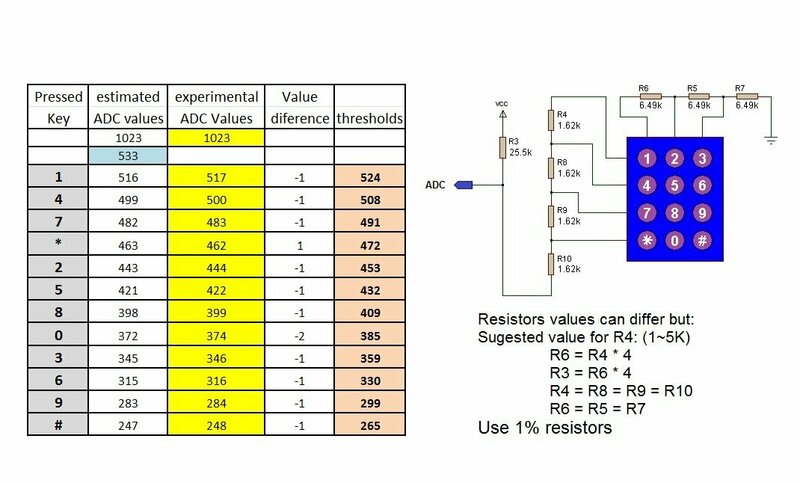 The resistor networw is designed to produce diferent voltage levels for each key pressed. 7-Segment Serial Display COM-11441 from Sparkfun. 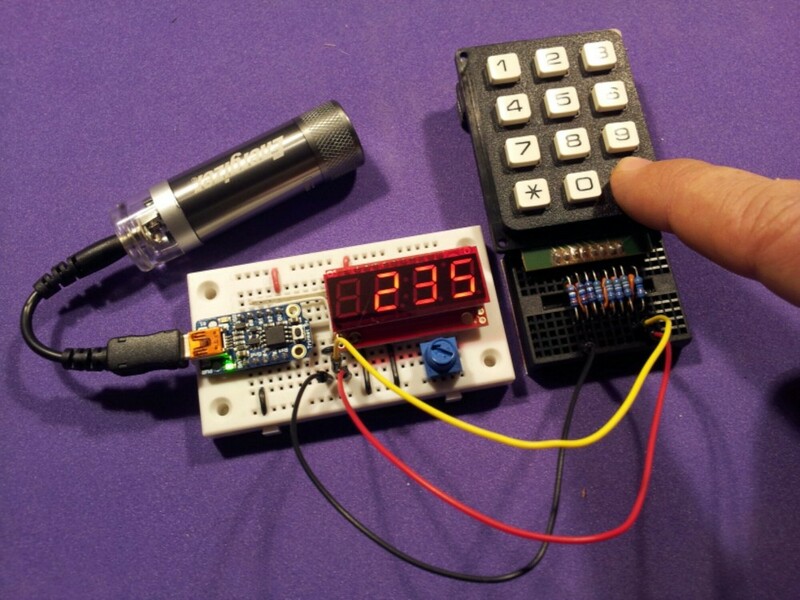 Implemented using the Arduino Trinket (5V, 8Mhz) from Adafruit. Serial transmission at 9600 bauds using bit banging. BITTIME delay was determined using an oscilloscope. #define TXDATA    0         // Pin used to transmit data. #define ADIN      1         // pin used to read the analog value. #define BITTIME   93        // Adjusted experimentally to obtain 9600 bauds. #define DEBOUNCE  5         // number of detections before key validation. int lastkey= -1;          // No key. boolean released= true;   // No key pressed estatus. boolean  newline= true;   // flag to clean screen before new value entry. int validkey=0;           // used as debounce counter. int analog;               // value of the analog pin. delayMicroseconds(BITTIME*2);          // wait 2 Stop bits. delayMicroseconds(BITTIME);            // wait Start bit. key=-1;					        // no key pressed. delay(5);         // experimental, 5 works fine. (10 is to slow). The code was added, thanks for asking.